Along with our flat snap hooks, you will find twisted snap hook fittings ideal for ratchet straps. Manufactured to a high standard and offered in a range of practical sizes, our twisted snap hook fittings are safe and convenient to use for load lashing applications of all types. Why Buy Twisted Snap Hook fittings? While flat snap hooks sit flush with the strap, twisted strap hooks are oriented at 90 degrees so that they can clip onto an anchor point that aligns with this angle. They can be deployed for various purposes, but they tend to be used most commonly to stop loads from shifting while in transit. 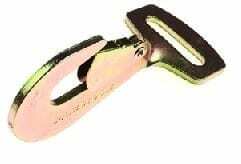 You can find ratchet strap fittings of all types on our site, including a broad selection of hooks for different purposes. With zinc plating available, the resilience of our twisted snap hook fittings are assured. This not only makes them durable, but also surprisingly versatile. Furthermore our twisted snap hooks have the advantage of being equipped with a safety catch. This lessens the likelihood that the strap will slip off an anchor point of its own accord. Safety catches are also available on our chassis hook range so you are not limited to relying on a twisted snap hook to access this feature. Need Tips for Twisted Snap Hook Use? If you are not sure about whether twisted snap hooks are the right choice of ratchet strap fitting for you, get in touch with us and we can clear up any uncertainties. Ask us a question online or call 01384 78004 to speak to our team. Twisted Snap Hook Fittings Overall rating: 5 out of 5 based on 6 reviews.